The East Meadow, the future site of Family Student Housing as detailed in the new revision environmental impact report. Photo by Chloe Reynolds. 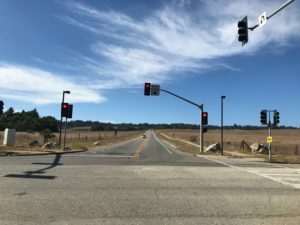 Over the summer, Chancellor George Blumenthal informed UC Santa Cruz and the city of Santa Cruz of critical updates to the Student Housing West (SHW) Project, the plan to build 3,072 more bed spaces on campus. The university drafted and published a revised version of the environmental impact report (EIR) in response to large amounts of feedback from staff, students, faculty, alumni and community members. Amid concern, construction is still planned for the East Meadow site. The revised report detailed significant changes to proposed construction at both the Hagar site at the East Meadow and Heller site at the current location of Family Student Housing. The original timeline for completion was delayed 45 days in spring 2018, when the planning committee extended the public comments period. The plan was originally set to break ground this September. The project planning team will propose the revised EIR to the UC Board of Regents in January for approval of the changes and design. Family Student Housing on the new Hagar site will be set to open in spring of 2020. The first phases of the west Heller site would be done in fall 2022 with completion of the Heller site in fall 2023. The Hagar site will be the new location for Family Student Housing, and will host 140 housing units. The new project will also work to grade the Hagar site, leveling the ground to reduce the buildings’ visibility from other places on campus. The new plan decreases the size of the buildings on the Heller site — current site of Family Student Housing — by an average of 20 percent. This change will not sacrifice the number of beds — 2,900 — but increase the number of shared rooms. The original SHW plan at the Heller site proposed 70 percent of the dormitories as singles, but the revised environmental impact report decreased that to 53 percent singles to make room for more communal living spaces, said Vice Chancellor Sarah Latham. The change will also make the project more affordable to students, Blumenthal said. Since its release on Sept. 17, the revised report will be open for public review until Nov. 1 at 5 p.m. As a supplement of the revision, two additional comment periods will be held to gather feedback. Information and public comment hearings will be held on Tues. Oct. 23 at 6:30 p.m. at the Louden Nelson Community Center, and Wed. Oct. 24 at 5 p.m. at the Kresge College Town Hall.